Splash One: military pilot and flight simulation fan. "Military aviation background for forty-two years. Just starting to get to grips with PCs!" Read his guide to Jet Pilot. 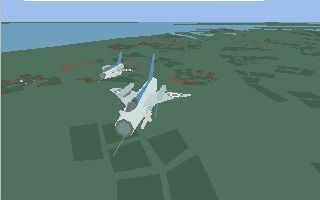 MiG-21 Fishbed in Jet Pilot for the Commodore Amiga, 1996. Military aviation background for forty-two years. Just starting to get to grips with PCs!